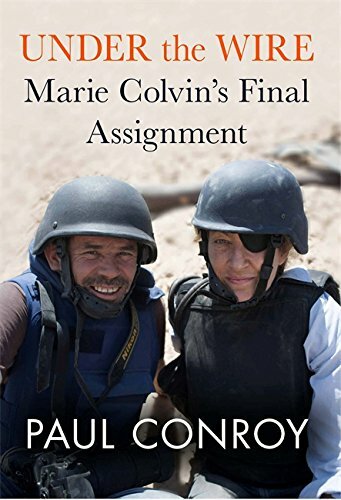 If you’re looking to make an easy $10 million or more, immediately go out and option the movie rights to Paul Conroy’s edge-of-the-seat nonfiction thriller, Under the Wire: Marie Colvin’s Final Assignment. This book is a movie waiting to happen. A George Clooney movie. A Brad Pitt movie. A fill in the blank with your favorite action star movie. It’s that good. Conroy is a British newspaper photographer who traveled to one of the most dangerous parts of Syria—as if all of Syria were not incredibly dangerous right now—in February, 2012. He was accompanying a broadcast journalist, Marie Colvin, no stranger herself to war zones, with whom he had worked in Libya during the fall of Gaddafi and in other similarly bleak and dangerous locales. Colvin, we learn at the outset of the book, would die in Homs, a Syrian city methodically reduced to rubble by Bashar al-Assad, the ophthalmologist turned mass murderer running Syria. The book goes back and forth between their experiences in Syria and Tripoli, with a focus on Colvin’s last tumultuous days. In order to get to the particular neighborhood in Homs that seems to have most attracted Assad’s ire, it was necessary to first be smuggled from Lebanon into Syria, itself a dicey proposition, and then travel via a dark, dangerous, and suffocatingly claustrophobic tunnel. Colvin and Conroy made the journey together not once but twice, leaving the first time when they heard reports that Assad was about to launch the final assault on the city that would have destroyed everything in sight, including the two of them. When they escaped through the tunnel to freedom, they learned that the alarm had been a false alarm, and Colvin convinced Conroy that if they didn’t return to Homs, then the slaughter of the innocents in that town would go unreported. When people typically think about news photographers and reporters who go into these danger zones, to the extent that we think about them at all, we focus on the adrenaline junkie aspect. Colvin and Conroy may well have been thus afflicted, but they also seem to have been primarily motivated by a desire to provide testimony to the world about the needless suffering of civilians in war zones, whose plight would indeed go unrecorded if it were not for such courageous individuals as themselves. For that reason, they put themselves in Homs’ way not once but twice. On the way back to the tunnel to head into the dying neighborhood of Baba Amr during February 2012, Conroy, the photographer and the author of this spellbinding book, experienced considerable doubt as to the safety of the mission. He felt that unshakeable sixth sense that tells us when danger is imminent and must be avoided. Colvin, however, would have none of it. She convinced him to overcome his fears and concerns. They reentered the tunnel and made their way back to the neighborhood, where many of the buildings they had already visited had been destroyed in the few days since they were last there. Sure enough, Marie Colvin, veteran of many foreign wars, met her end in a rocket attack on that second visit. Conroy did not come away unscathed himself. Much of his leg was blown off in the same attack. He initially used a computer Ethernet cable as a tourniquet, and was treated in the same field hospital as the Syrian civilian victims of Assad’s assault. He barely hung onto life, made his way back through the tunnel, this time missing much of one leg, and made a harrowing, bullet-ridden journey to freedom. Under the Wire illustrates graphically not just the experiences of war photographers and reporters, but also gives us an insider’s look at the lives of the courageous few battling to the end against a regime that has already murdered more than 120,000 of its own citizens. Under the Wire is dramatic, brisk, entertaining at times, deeply emotional, and above all, beautifully told. If you really want to understand modern warfare, grab this book. Just a warning: By no stretch of the imagination does this book present a pretty picture. They say that in war, truth is the first casualty. Sometimes, the bearers of truth are also casualties, and you will find no better proof of that adage than in Under the Wire.